Stebbing is a small village 3 miles north-east of Great Dunmow. 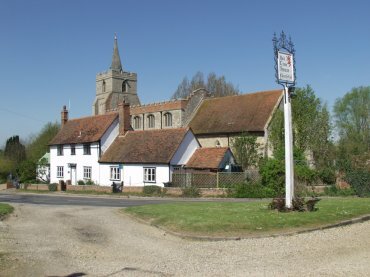 Just a mile to the south is the Roman Stane Street, now the B1256 road, which runs east from Great Dunmow and there are traces of a Roman building under Stebbing village green. 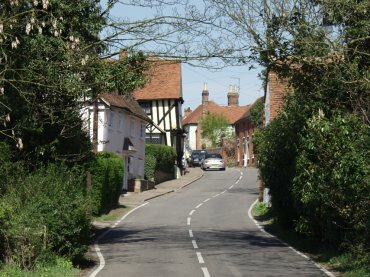 This view is from the southern end of High Street. Looking south along High Street with the church tower and spire just showing over the roof tops. This is a pretty village with many ancient buildings many of them warped with age - look at the ridge on the roof of the pink house at the far end. 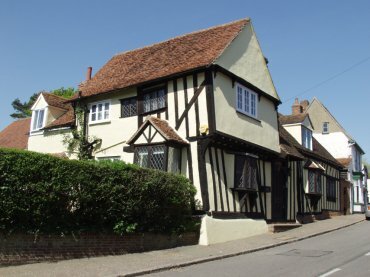 This timber-framed house in High Street dates from the 15th century and has the typical jettied structure of the upper storey. 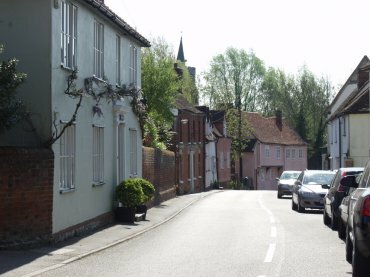 A number of the other buildings in Stebbing also have the typical jettied appearance. The church of St. Mary the Virgin, Stebbing. The 14th century church, seen behind a cottage from outside the Old Red Lion, belonged originally to the Knights Hospitallers of St. John. This church looks distinguished and beautiful from outside but holds an unusual secret within.